Xcel Surveying has been providing Topographic Surveys to a range of clients in Perth since its conception in 2008. Ranging from small scale residential building projects, feature and contour surveys to large scale topographic surveys for commercial and engineering projects. A feature & contour survey, also known as a topographic or detail survey, is required for almost any development that involves design work by an architect, draftsman or engineer. It requires a surveyor to accurately measure the location of existing site features such as; buildings, trees, services, footpaths, retaining walls, driveways, fencing & ground levels. Once this data has been collected using specialist drafting software an accurate feature & contour plan is produced of the site. Xcel Surveying feature and contour surveys are submitted in digital and hard copy formats and meet all standard council, architectural and building requirements. Our land surveying services include Topographic Surveys in Perth. Topographic Surveys are a graphical representation of the lay of the land. They can be used to determine the extent of cut and fill needed, the height of retaining walls, and the overall finished height of buildings referenced back to natural ground level and also used for calculation of earthworks volumes quantities. Before any design of a new development and engineering project can take place a topographical survey needs to be carried out. From commercial or industrial sites to Greenfield sites we can produce complete and accurate topographical models. We have completed numerous large scale topographic surveys in Perth such as digital ground surveys for roads projects, large industrial sites for earthworks quantities, feature and detail surveys including drainage and underground services for various clients such as local councils, engineering firms and construction companies. 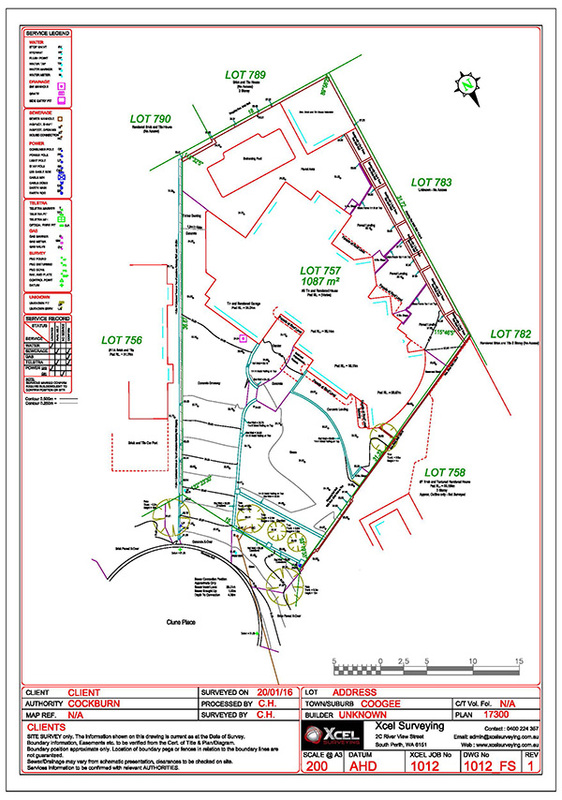 To discuss your Feature and Contour Survey, Detail Survey or Topographic Survey in Perth in more detail Call Xcel Surveying on 0400224357 or fill out our online contact form and we will get in touch with you promptly.